Since 1965, Outward Bound has served tens of thousands of students on wilderness expeditions. Safety is a top priority for us. We are proud of our excellent safety record over that time and continuously review and refine our safety policies and practices to maintain that record. While it is important to recognize that there are real risks associated with participating in outdoor activities, learning to manage those risks is also a part of every course. Each student is expected to play a role in their own safety by adhering to the rules, policies, and procedures set up by the instructors and staff members while at Northwest Outward Bound School. Our risk management efforts include: periodic safety reviews of courses, stringent hiring requirements and annual instructor evaluations, the development of comprehensive program plans and emergency response plans, and the requirement that our instructors be certified as Wilderness First Responders. Even with these measures, risk of serious injury, property damage and death cannot be eliminated. While we cannot completely eliminate these risks, our focus on risk management allows participants to face challenges, to travel into remote areas and to meet success. NWOBS instructors receive regular training in the outdoor activities and environments in which we run our courses. In addition to meeting state and federal requirements for their positions, all instructors are certified Wilderness First Responders; some are Wilderness Emergency Medical Technicians, or equivalent. Our programs are regularly reviewed by outdoor professionals from inside and outside the Outward Bound system in order to identify potential hazards and update best practices. Outward Bound has been a national leader in wilderness safety for over 50 years, and frequently advises and assists other organizations in outdoor adventure risk management. Outward Bound staff are trained to identify, assess and approach risk as a learning tool, to be managed but not eliminated. They anticipate and teach the management of the risks inherent in travel in remote areas. The intent is not to avoid activities involving risk but to recognize, prepare for, and successfully manage that risk. Risk, along with challenge, is part of the learning environment in which students develop skills, attention to detail, physical fitness, and leadership. They are trained in wilderness medicine, search, rescue and emergency management, but they cannot guarantee your absolute safety. Each course carries a radio and/or a cellular or satellite phone for emergency communication. However, coverage in the backcountry is limited and there is no guarantee that any electronic device will work at any given time from any given location. Instructors work in teams of two or three, teaching six to ten students. Instructor teams are often gender balanced, but balancing skills and teaching styles is the primary staffing concern. One instructor in every team is a lead instructor with multiple seasons of training and experience who has single point accountability for the safety and effectiveness of the course in the field, and for mentoring the other staff. Medical: All have CPR, and are Wilderness First Responders; many have Emergency Medical Technician, Medical Person in Charge (US Coast Guard), or Outdoor Emergency Care (National Ski Patrol) as well. Whitewater, mountaineering, and rock climbing instructors are trained and assessed according to an industry leading, in-house standard that draws from American Canoe Association (ACA) canoeing and swift water rescue standards, and American Mountain Guides Association (AMGA) climbing instructor standards. Our supervision policies are based on our belief that well-trained and educated teenagers and adults alike make good decisions with or without direct instructor supervision. Outward Bound maintains high staff-to-student ratios (approximately 1:5), and from the beginning of the course, instructors will teach the skills necessary for safe wilderness living and travel. There will also be times when students are not directly supervised, such as when cooking, setting up tarps, camping, sleeping and solo. At such times, the instructors will be nearby and the students will be able to ask questions or get help if needed. For the majority of the course, students will be with their instructors but the instructors often do not sleep in the same shelters with them, and they do not monitor them constantly. As part of our ceaseless effort to monitor and improve safety, NWOBS programs are regularly reviewed and audited by both internal and external teams in order to proactively identify and assess potential hazards as well as areas of commendation. Outward Bound has been a leader in wilderness safety and risk management for 50 years and is a co-sponsor of the annual Wilderness Risk Management Conference (WRMC). 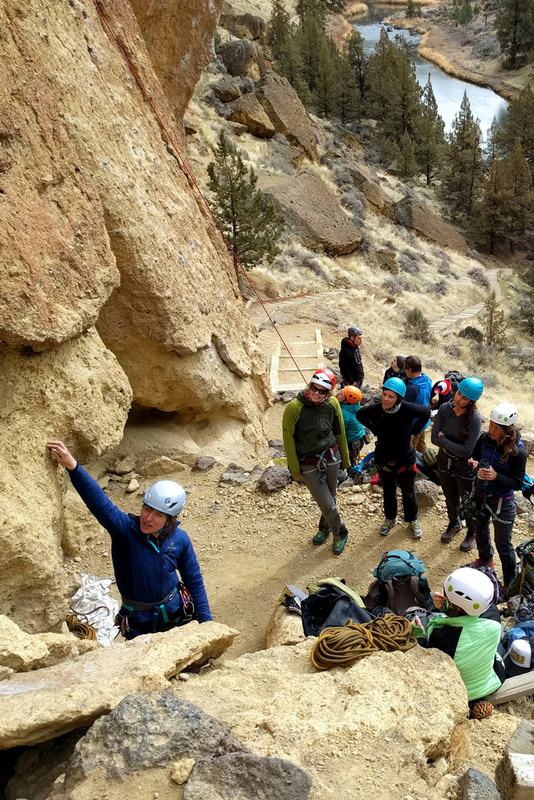 This national conference convenes outdoor industry leaders to learn and collaborate, to advancing safety and risk management in the outdoor education and wilderness adventure community.